Renewal of P23A/B and P25 points located south of Camden Town Station. The renewal will be staged over two closures which are scheduled for 30 March to 2 April 2018 (Stage 1) and 26 to 28 May 2018 (Stage 2). I note on the second closure that trains will be reversing at Hampstead whereas this time it’s Golders Green. Any reason for that? Also, would it not have been possible to reverse Bank branch trains at Euston, or is that too close to Camden in terms of power arrangements? Would it not have been possible to reverse Bank branch trains at Euston, or is that too close to Camden in terms of power arrangements? I think you'd get too close on powers as coming into P6 at Euston (SB Bank Branch) would take you right up to the next section (Camden to Euston City S.B), also the connection with the Picc line would probably be needed for a job like this. Mornington Crescent is also in the same section as the work site (Euston CX to/from Camden). Points works at Archway too this weekend. A tranche of photos courtesy of the Northern line Twitter feed of this easters works at Camden. Odd service pattern with twice as many trains running to Moorgate as Charing Cross. I’m surprised it’s not 6 mins to each. It’s a bit mean to only give a 10 min service to Charing Cross, especially as the trains were quite crowded towards the late afternoon. Any idea what this is for? 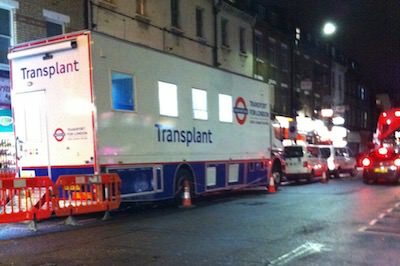 It's currently parked outside Camden Town station. According to 'LTSV.com' it's a mobile office. I see on the official Northern Line Twitter feed that the works are overrunning and there is likely to be disruption tomorrow. It seems quite sensible to pre-warn people so that they can make alternative arrangements in advance. The delay is understandable, given the scale and complexity of the task. I imagine that the concrete needs to set before trains can run over it, the signalling re-connected and tested etc. I wonder if it was an ambitious plan to get the work completed over a 4 day bank holiday in the first place? Updated Twitter now only mentions possible disruption to early morning services. Maybe it’s not looking as bad as first feared. There was (quite rightly) similar cautionary advice issued when the trailing crossover on the Bakerloo line at Paddington was replaced, I think from memory that advice was not needed as the disruption to the start of traffic was not as widespread as initially publicized. I don’t blame them for covering themselves just in case. There are plenty of times on a Sunday I've heard recorded announcements about engineering work that took place the previous day. I particularly recall this at Debden but it's not the only offender.